Muscari armeniacum Blue spike growing herbaceous geophyte of the genus Muscari also known as Grapes hyacinth, Muscari armeniacum Blue spike perennial evergreen plant, plant edible bulbs also used as ornamental plant some spices have fragrant flowers, can grow in temperate, subtropical or mediterranean climate and growing in hardiness zone 4-9. 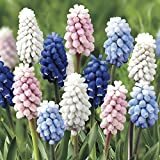 Flower color blue, the flower shape likes small grapes, flowers grow in stalks. 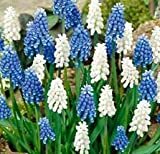 Bulb edible, bulbs shape like drops, small 2-3 cm, colors yellow the outer and white in the inner. 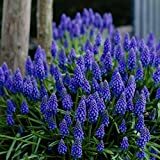 30 Seeds Muscari armeniacum - Perennial Grape Hyacinth. 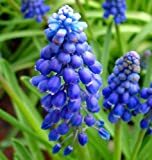 Beautiful Flower Spikes with Tender Blue Bell Like Flowers. 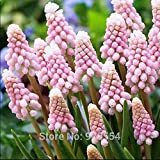 Bulbs shape like drops bulbs, small 2-3 cm, colors yellow the outer and white in the inner.